Follow the hot pineapple trend and offer this exquisite pineapple favor at your next special event! This classy pineapple favor symbolizes a warm welcome, hospitality, friendship, generosity and other forms of social warmth and graciousness. Our premium glass Choice Crystal pineapple features an intricately faceted clear glistening glass pineapple bottom. On top of the pineapple is an exquisitely carved pineapple stalk in a delicate gold color crystal. The pineapple charm is attached to a gold metal chain and ring. 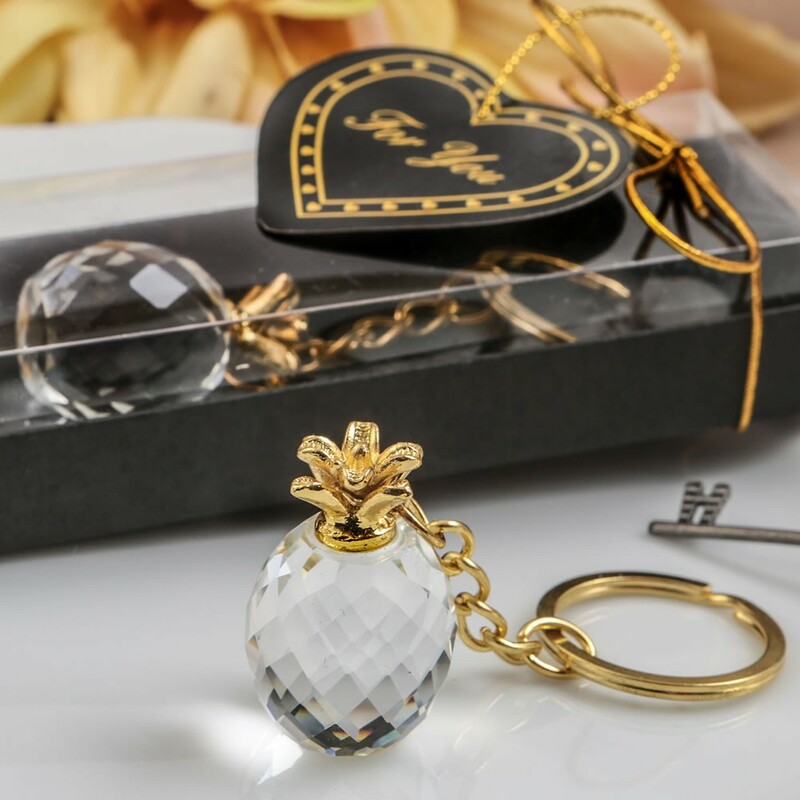 Size 3 1/4" x 7/8" x 7/8" Choice Crystal pineapple key chain from the Warm Welcome Collection Made from glass crystal Intricately faceted clear glass pineapple bottom Exquisite carved metal pineapple stalk on top in a gold color Charm is attached to a gold metal chain and ring Packaged in a black delux gift box Box has a clear display top for easy viewing Box wrapped with gold metallic ribbon and bow Attached to the ribbon is a heart shaped 'For You' tag A stylish and on-trend favor for any grand occasion that is sure to delight your guests with its warm welcome message!